Ernest Borgnine ( born Ermes Effron Borgnino (Italian: ); January 24, 1917 – July 8, 2012) was an American actor whose career spanned over six decades. He was noted for his gruff but calm voice, Machiavellian eyebrows, and gap-toothed Cheshire cat grin. A popular performer, he had also appeared as a guest on numerous talk shows and as a panelist on several game shows. Borgnine’s film career began in 1951, and included supporting roles in China Corsair (1951), From Here to Eternity (1953), Vera Cruz (1954) and Bad Day at Black Rock (1955). He also played the unconventional lead in many films, winning the Academy Award for Best Actor for Marty (1955). He achieved continuing success in the sitcom McHale’s Navy (1962 – 1966), in which he played the title character, and co-starred as Dominic Santini in the action series Airwolf (1984 – 1986), in addition to a wide variety of other roles. Borgnine earned his third Primetime Emmy Award nomination at age 92 for his work on the 2009 series finale of ER. He was known as the original voice of Mermaid Man on SpongeBob SquarePants from 1999 until his death in 2012. He had earlier replaced the late Vic Tayback as the voice of the villainous Carface in both All Dogs Go to Heaven 2 (1996) and All Dogs Go to Heaven: The Series (1996 – 1998). Ernest Borgnine was born Ermes Effron Borgnino on January 24, 1917 in Hamden, Connecticut, the son of Italian immigrants. His mother, Anna (ne Boselli; 1894c. 1949), hailed from Carpi, near Modena, while his father Camillo Borgnino (18911975) was a native of Ottiglio near Alessandria. 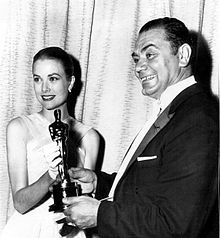 Borgnine’s parents separated when he was two years old, and he then lived with his mother in Italy for about four and a half years. By 1923, his parents had reconciled, the family name was changed from Borgnino to Borgnine, and his father changed his first name to Charles. Borgnine had a younger sister, Evelyn Borgnine Velardi (19252013). The family settled in New Haven, Connecticut, where Borgnine graduated from James Hillhouse High School. He took to sports while growing up, but showed no interest in acting. Borgnine wearing a chief petty officer’s cap in October 2004. She said, “You always like getting in front of people and making a fool of yourself, why don’t you give it a try?” I was sitting at the kitchen table and I saw this light. No kidding. It sounds crazy. And 10 years later, I had Grace Kelly handing me an Academy Award. He studied acting at the Randall School of Drama in Hartford, then moved to Virginia, where he became a member of the Barter Theatre in Abingdon, Virginia. It had been named for the director’s allowing audiences to barter produce for admission during the cash-lean years of the Great Depression. 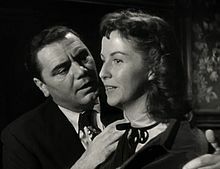 In 1947, Borgnine landed his first stage role in State of the Union. Although it was a short role, he won over the audience. His next role was as the Gentleman Caller in Tennessee Williams‘ The Glass Menagerie. An appearance as the villain on TV’s Captain Video led to Borgnine’s casting in the motion picture The Whistle at Eaton Falls (1951) for Columbia Pictures. That year, Borgnine moved to Los Angeles, California, where he eventually received his big break in Columbia’s From Here to Eternity (1953), playing the sadistic Sergeant “Fatso” Judson, who beats a stockade prisoner in his charge, Angelo Maggio (played by Frank Sinatra). Borgnine built a reputation as a dependable character actor and played villains in early films, including movies such as Johnny Guitar, Vera Cruz, and Bad Day at Black Rock. Borgnine’s film career flourished for the next three decades, including roles in The Flight of the Phoenix (1965), The Dirty Dozen (1967), Ice Station Zebra (1968), The Poseidon Adventure (1972), Emperor of the North (1973), Convoy (1978), The Black Hole (1979), and Escape from New York (1981). I did . Because to me, every picture should have some kind of a moral to it. I feel that when we used to watch old pictures, as we still do I’m sure, the bad guys always got it in the end and the good guys always won out. Today it’s a little different. Today it seems that the bad guys are getting the good end of it. There was always a moral in our story. Borgnine made his TV debut as a character actor in Captain Video and His Video Rangers, beginning in 1951. These two episodes led to countless other television roles that Borgnine would gain in Goodyear Television Playhouse, The Ford Television Theatre, Fireside Theatre, Frontier Justice, Laramie, Bob Hope Presents the Chrysler Theatre, Run for Your Life, Little House on the Prairie (a two-part episode entitled “The Lord is My Shepherd”), The Love Boat, Magnum, P.I., Highway to Heaven, Murder, She Wrote, Walker, Texas Ranger, Home Improvement, Touched by an Angel, the final episodes of ER, the first episode of Wagon Train, and many others. In 2009, at the age of 92, Borgnine earned a Primetime Emmy Award nomination for his performance as Paul Manning in the series finale of ER, entitled “And in the End…“. He made his first appearance as the character in the preceding episode “Old Times”. In 1962, Borgnine signed a contract with Universal Studios for the lead role as the gruff but lovable skipper, Quinton McHale, in what began as a serious one-hour 1962 episode called Seven Against the Sea for Alcoa Premiere, and later reworked to a comedy called McHale’s Navy, a World War II sitcom, which also co-starred unfamiliar comedians Joe Flynn as Capt. Wally Binghamton and Tim Conway as Ens. Charles Parker. The insubordinate crew of PT-73 helped the show become an overnight success during its first season, landing in the Top 30 in 1963. Like the McHale character, Borgnine was a longtime navy man in real life. He thrived on the adulation from fans for their favorite navy man, and in 1963 received an Emmy nomination for Outstanding Lead Actor in a Comedy Series. At the end of the fourth season, in 1966 low ratings and repetitive storylines brought McHale’s Navy to an end. Borgnine returned to a new contract with Universal Studios in 1983, for a co-starring role opposite Jan-Michael Vincent, on Airwolf. After he was approached by producer Donald P. Bellisario, who had been impressed by Borgnine’s guest role as a wrestler in a 1982 episode of Magnum, P.I., he immediately agreed. He played Dominic Santini, a helicopter pilot, in the series, which became an immediate hit. Borgnine’s strong performances belied his exhaustion due to the grueling production schedule, and the challenges of working with his younger, troubled series lead. The show was cancelled by CBS in 1986. In 1996, Borgnine starred in the televised fantasy/thriller film Merlin’s Shop of Mystical Wonders (partially adapted from the 1984 horror film The Devil’s Gift). As narrator and storyteller, Borgnine recounts a string of related supernatural tales, his modern-day fables notably centering on an enchanted and malicious cymbal-banging monkey toy stolen from the wizard Merlin. The film was later featured in the parodical television series Mystery Science Theater 3000, and has since gained a prominent cult following. Starting in 1999, Borgnine provided his voice talent to the animated sitcom SpongeBob SquarePants as the elderly superhero Mermaid Man (where he was paired up with his McHale’s Navy co-star Tim Conway as the voice of Mermaid Man’s sidekick Barnacle Boy). He expressed affection for this role, in no small part for its popularity among children. After his death Nickelodeon re-aired all of the episodes in which Mermaid Man appeared in memoriam. Borgnine also appeared as himself in The Simpsons episode “Boy-Scoutz ‘n the Hood“, in addition to a number of television commercials. In 2000, he was the executive producer of Hoover, in which he was the only credited actor. Borgnine’s autobiography Ernie was published by Citadel Press in July 2008. Ernie is a loose, conversational recollection of highlights from his acting career and notable events from his personal life. On April 2, 2009, he appeared in the last episode of the long-running medical series ER. His role was that of a husband whose long marriage ended with his wife’s death. In his final scene, his character is in a hospital bed lying beside his just-deceased wife. His performance garnered an Emmy nomination for Outstanding Guest Actor in a Drama Series, his third nomination and his first in 29 years (since being nominated for Outstanding Supporting Actor in a Limited Series or a Special in 1980 for All Quiet on the Western Front). Borgnine married five times. His first marriage, from 1949 to 1958, was to Rhoda Kemins, whom he met while serving in the Navy. They had one daughter, Nancee (born May 28, 1952). He was then married to actress Katy Jurado from 1959 to 1963. Borgnine’s marriage to singer Ethel Merman in 1964 lasted only 32 days. Their time together was mostly spent hurling profane insults at each other, and both would later admit that the marriage was a colossal mistake (Merman’s description of the marriage in her autobiography was a solitary blank page). Their divorce was finalized on May 25, 1965. In 2000, Borgnine received his 50-year pin as a Freemason at Abingdon Lodge No. 48 in Abingdon, Virginia. He joined the Scottish Rite Valley of Los Angeles in 1964, received the KCCH in 1979, was crowned a 33 Inspector General Honorary in 1983, and received the Grand Cross of the Court of Honour in 1991. Borgnine’s hometown of Hamden, Connecticut, where he enjoyed a large and vocal following, named a street in his honor. For 30 years (19722002), Borgnine marched in Milwaukee‘s annual Great Circus Parade as the “Grand Clown”. In 2006 the comune of Ottiglio, Italy, his father’s birthplace, gave him the honorary citizenship. For his contribution to the motion picture industry, Ernest Borgnine received a star on the Hollywood Walk of Fame at 6324 Hollywood Blvd. In 1996, he was inducted into the Western Performers Hall of Fame at the National Cowboy & Western Heritage Museum in Oklahoma City. In 2000, Borgnine received his 50-year pin as a Freemason in Abingdon Lodge No. 48, Abingdon, Virginia. He joined the Scottish Rite Valley of Los Angeles (in the Southern Jurisdiction of the U.S.A) in 1964, received the KCCH in 1979, was crowned a 33 Inspector General Honorary in 1983, and received the Grand Cross of the Court of Honour in 1991. He was also a member of the Loyal Order of Moose at that organization’s Lodge in Junction City, Oregon. He volunteered to be Stories of Service National spokesman, urging his fellow World War II vets to come forward and share their stories.